Jake Odorizzi was a spotless 3-0 in four starts against the Astros in his career, mostly with Tampa Bay. Was it a change of uniforms that made the difference Wednesday or was it just Alex Bregman? The Houston third sacker is making his case for an MVP Award after winning the All-Star Game MVP back in July. 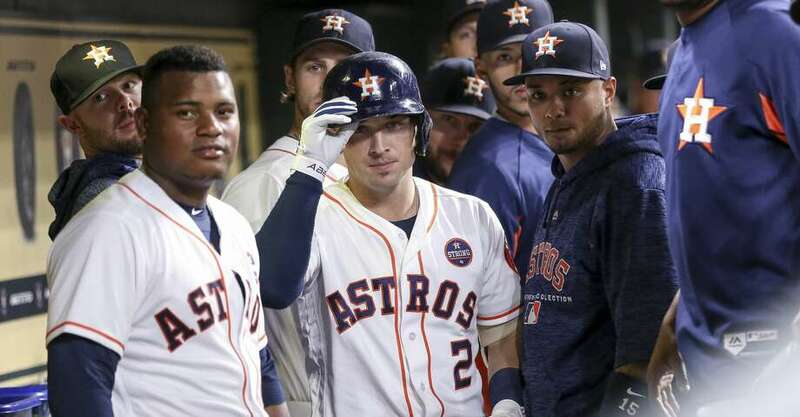 Bregman homered (his 29th) and drove in five to lead the Astros past Minnesota, 9-1, for Houston's fifth straight win and a sweep of the normally troublesome Twins. Oakland is mauling the Yankees early so expect Houston's lead Thursday morning to be 3-1/2 in the A.L. West. Bregman's line drive homer off Odorizzi in the third was his fourth in the last five games. Evan Gattis drilled a two-run homer of his own in the fourth. Yuli Gurriel plated Jose Altuve in the fifth then Altuve doubled home George Springer in the sixth to build the margin to 6-1 as Altuve snapped an 0-for-19 slump. Bregman encored with a bases-loaded double to left to give him five RBIs, pushing his team lead to 96. The double was his 47th this year, tops in the American League. Framber Valdez shrugged off some early wildness to get the win, lasting 5-1/3rd innings with just one run allowed - a solo homer from Willians Astudillo. Five relievers chipped in, including Dean Deetz who recorded the final two outs in his big league debut. The Astros now have 13 road games left on the schedule with one nine-game homestand remaining. After Thursday off, the Astros will start a three-game set in Boston versus the team with baseball's best record. Oakland is playing the Rangers and it is perhaps their last best chance to vault their way back into a tie with Houston. Gerrit Cole (13-5) will pitch Friday's 6:10 pm Central opener against lefty David Price (14-6). Charlie Morton will come off the disabled list to start Saturday's game and Dallas Keuchel will toss the Sunday night finale. Carlos Correa sat out for the second straight game with a sore bat and a sore back. Marwin Gonzalez also rested, causing Bregman and Gurriel to split time at shortstop. Houston pitchers have averaged less than two runs allowed per game this month.